Sweden and Russia aren't exactly neighbouring countries, but still Simon from Sweden and SL from Russia found a way to collaborate through the band Wall of the Eyeless. Their previous demo, 2011's Through Emptiness, was generally well-received by critics, and thus 2013 saw the release of the second demo from the hands and throats of the Swedish drummer and the Russian string-rider slash vocalist. Throughout the Wimfolsfestta demo unfolds dream-like melodies veiled in thick shrouds of colorless distortion, which only on special occassions lets anything shine through. A few holes in the curtains of distortion are divulged every so often, laying bare the inner workings of Wall of the Eyeless. The best examples of the duality of their sound is the folk-like interruption in Revulsion Fever, which in turn is taken over by one of the demo's best and most original riffs. Another example is the ferocious blast in Longest Winter, and at this point it becomes apparent that what gives this band appeal is this type of bipolar songwriting. The weird bends in the ponderously melodic introductory track "Flicker" leaves a small aftertaste of Inquisition's newer offerings, albeit with quite a different atmosphere. The generally cold atmosphere of their songwriting contrasts nicely with the warm guitar sound, and while there's nothing wrong with the way they bend the instruments to their will it all feels a bit soulless. Wimfolsfestta is completely effortless in the sense that it's missing boldness. SL's growls are a bit on the hollow side, and while his and the band's efforts are at the very least highly consistent, it is a consistency that in the long run comes off as a bit shy and underfed. This kind of Agalloch-inspired atmospheric post metal sound has really gained ground in these last few years with everyone pairing it with a genre and calling it progressive. The parts of Wall of the Eyeless that are actually death metal are mostly incredibly well-crafted, but the atmospheric parts on the other hand often come off as lazy attempts at a melodic approach that are, for the most part, poorly executed and bland. Some bands are experts in utilizing these riff types to their utmost extent, but with Wall of the Eyeless I feel it is poorly implemented. 6/10 guitars. Legionary is a band that has always been plagued by line-up changes, the only constant member being drummer Frank D'Erasmo, the creator of Legionary. The members have had ties to New Jersey thrashers Condition Critical as well as the death/thrash group Strychnia from the same area. First of all, I'm a little sad to see the departure of their previous vocalist, Tim Rocheny, from the lineup. After the release of Arcane Divisions, Legionary's debut album from 2012, Rocheny went on to become the vocalist of the Razorback-signed death metal band Mausoleum. Legionary hail from the North Eastern parts of the US, but if there's anything northern about their sound it's the inspiration they've taken from Scandinavian melodic death metal. Their modus operandi is melody-based death metal with thrashy tendencies, fueled by D'Erasmo's ferocious drumming and the guitar leads of main riff-smith Rory S. Robinson, who is new to the band. The new vocalist, Kevin O'Laughlin from Strychnia, is a nice addition to the line-up and fills the shoes of Rocheny adequately. The familiar sound of thrashy tremolos fills the ears once again when Path of Tyranny is put to the test. The recipe works pretty well overall, though what was previously only a refreshing dash of melody added to the mix is now full-blown melodic death metal, albeit executed in a thrashier way than most. Tracks like Disgrace of the Union has a Kataklysm-esque feel to it during the fastest part where the O'Laughlin roars over the sound of D'Erasmo's ridiculously fast blast beats, which speaks volumes of their skills as musicians whether or not you like Kataklysm. I feel compelled to make the comparison between their debut album and this EP; On Arcane Divisions the earlier incarnation of the band were busy showcasing every aspect of their sound and songwriting, boldly displaying everything they could muster in terms of brutality and speed during the almost 50 minutes the album spanned, but this newer embodiment of the band seems more inclined to the more melodic side of their music. It seems to rely more on a sound that would invite showmanship - something that is especially noticable in the riveting Media Complex and through their incredibly flashy guitar solos - rather than musicianship. While the Path of Tyranny EP is more melodic than Arcane Divisions it is also more controlled, releasing its violent outburts in a more disciplined fasion. This in turn makes room for compositions that are principally more technical in their nature, but I can not help but notice how the presence of only one guitarist has trouble filling the void left by another guitarist. The sound on the album simply felt more layered and wholesome, and it would seem that while the songwriting itself hasn't changed much, the musical approach has. Path of Tyranny, in all its glory, misses a little punch and doesn't feel as ruthlessly uncompromising as the band's previous efforts. 6/10 guitars. It hasn't taken long for Trou Noir to produce their first demo. Released the same year the band was formed, Echoes in Black Holes is an international effort consisting of Worbid and Monork from Russia and Dunkel supplying the vocals from France. The internet has made it possible for musicians from all over the world to easily collaborate and create diverse variations of genres that are otherwise often heavily coloured by its regional scene. Between them the three members of Trou Noir - or "Black Hole" in French - have been in at least nine bands that have collectively released in excess of fifty demos, EPs, splits and albums, meaning that this unholy trinity are at least in some way seasoned musicians. A vital element within Echoes in Black Holes is the way they utilize ambience. Monork's arpeggiated notes form the backbone of the demo with the minimalistic drumming of Worbid providing the rhythmic coherence. The two usher in the raw vocals of Dunkel, which bear a striking resemblance to those of Varg Vikernes on Det Som Engang Var. The transitions between the ten tracks on Trou Noir's first demo are seamless and immaculate, making the whole demo coalesce with each element being consistently integrated without much effort. Each track neatly segues from cold and melancholic melodies to more ambience-laden passages with the arpeggiated notes working to add depth to the music. To continue the Burzum analogy; If the vocals are Det Som Engang Var, the music itself is closer to Filosofem or Hlidskjalf, but without opting for the same droning approach. Any music enthusiast will know that it's hard to get riled up if the musicians delivering the music aren't engaging about their business and deliver their tunes in a convincing way. Accusing Darkspace's first demo from 2002 of being varied, extravagant or musically eloquent seems almost an insult, and yet Darkspace have become a modern day cult in themselves. Their music is droning and monotone, but it works extraordinarily with the monotony becoming the main attraction which makes it all the more hypnotic. You might be wondering why I'm talking about Darkspace rather than Trou Noir, but when it comes to spacy ambient, atmospheric black metal a band such as Darkspace automatically becomes the standard to which similar bands are held, and while Trou Noir and Darkspace have only minute elements in common, it seems as a necessary comparison to make. Trou Noir have opted for that very style, yet deliver their music with total abandon and insincerity. I can feel they're going for a trippy, psychedelic feel with the drawn out drum sequences and almost randomly picked guitar notes, but it becomes stale and unhypnotic in the execution process. There are a few good riffs once in a while, with the main riff in Black Hole Reverb being the prime example, and the vocals seem to generally be held to a higher standard than the rest of the demo, but all in all it feels like most songs are written the way they are for the sake of consistency rather than actually contributing a memorable element to the release as a whole. Their songwriting makes it very hard to remember any one moment on the demo, which in itself isn't inherently bad as proven by similar groups, but it becomes a fundamental problem when there is nothing else to remember the band or demo by. My problem is that the demo is too long for such an ineffective delivery of stale ideas. Darkspace got it right when they released their demo in 2002 featuring 25 minutes of their trademark spacey black metal, consisting of little other than spaced out walls of distorted guitar accompanied by ferocious blast beats. Echoes in Black Holes is overflowing with poorly executed melancholy that misses its target by a wide margin. 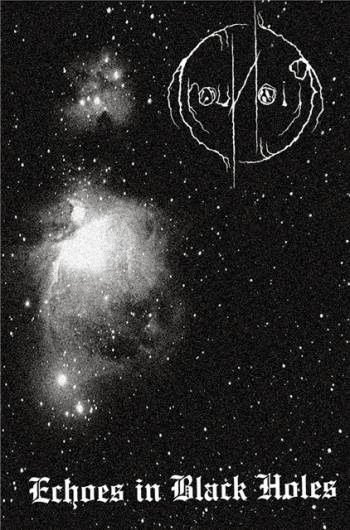 The cover art made a promise of better things - It made a promise of cosmic black metal engulfed in the cold, galactic aspects that this sound usually brings with it, but it was a promise it could not keep. The atmosphere is bedroomy rather than spacy, which is what primarily sets it apart from the great ones within the genre. Instead of going exploring within the psychedelic possibilites of their chosen style, they follow a linear path which doesn't suit their sound terribly well. 4/10 guitars. I have previously reviewed Balmog and Amnion from Spain, but the country itself is hardly known for its black metal scene. Perhaps it has something to do with the sunny weather, although the country's economic crisis in recent years and its towering youth unemployment rates should provide enough frustration, drive and lyrical material to go around. Or maybe those subjects are instead fueling thrash metal, punk and grindcore bands. Who knows. In any case there is something intriguing and exciting about extreme metal bands from unlikely places, and if black metal from Spain isn't an unlikely match I don't know what is. Non Pietatem Erit is thus far Fathomhell's only release. The duo started in 2010 and by 2012 had their first EP ready, centered around a cold atmosphere with a small amount of modernity added through the use of sparsely used synths and carefully programmed drums. More often than not programmed drumming is a product of laziness and as such often sounds completely terrible and poorly thought through. A few bands can bear this simplistic, inhuman, cold and mechanical approach, but most bands cannot. But with Fathomhell the drumming really isn't an issue; It feels thoroughly worked through and well-considered, and above all it is commendably well-integrated. This is not the only feat of Non Pietatem Erit, obviously. The sounds brought forth by the Spanish duo is that of a traditional approach to black metal without leaning decisively on any regional sound. It proposes glimpses into the melodic side of black metal, followed by deluges of distortion and blast beats, all neatly arranged into immaculate sequences. The track Illusions of Death reaches for titanic and epic magnificence with one of Fathomhell's most ambitious riffs, while "Devours the Light, Eats their Soul" goes a more traditional way with uninterrupted grittiness. The overall expression of Fathomhell's music is pretty good, although a tad bit ordinary. Even when they're feeling adventurous they're still just clinging to the same vestiges of melodic black metal. Even if the EP is well-crafted it feels like they're playing it safe and as a result comes across as completely inoffensive. Only rarely does Fathomhell break the veil of inocuousness, and whenever this happens it only leaves the listener with a feeling of wanting this part to play a bigger role in the grand scheme of things. 7/10 guitars.